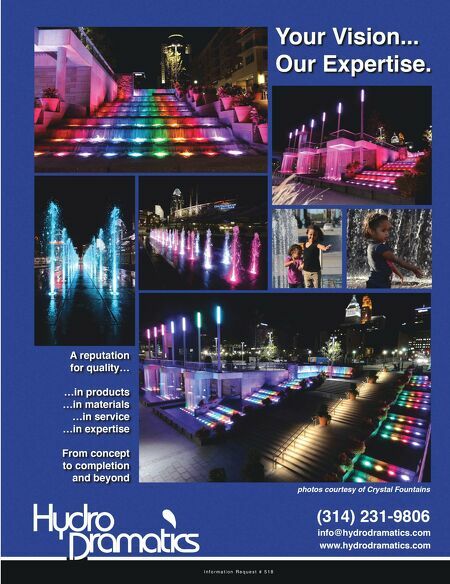 28 Landscape Architect and Specifier News 2016 Specifier's Guide decorative water features Pools / Vinyl Liner Kits Pools / Natural Pool Surfacing / Finish Pool Tiles Information Request # 9503 Fox Pool Corporation 800-815-6083 foxpool.com Complete inground vinyl liner swimming pool kits- customize to any shape—plus NEW Ultimate™ Pool for semi-inground installation—easy to sell, install and ideal for sloping backyards. Fox also has drop-in spas to beautify any backyard landscape project. Increase profits and set your business apart from the competition. Celebrating 59 years in business— Fox is looking for new dealers! See Ad on page 36 Information Request # 9504 Total Habitat 316-644-5848 TotalHabitat.com In Natural Swimming Pools/Ponds all over the country, our clients swim in clean, clear water with zero chemicals and no burning eyes! Join the new wave of homeowners and commercial property owners who are in favor of our beautiful, all-natural pools. Information Request # 9135 Poly Solutions, Inc. Poly Solutions, Inc. is your source for Ultra Poly One Coat, a VOC- free environmentally friendly coating for an easy, one coat roller application to most surfaces in pools, spas, ponds and fountains. 15-year warranty. 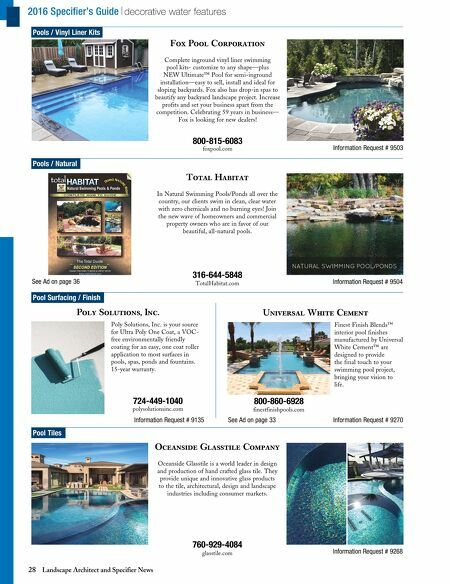 724-449-1040 polysolutionsinc.com Universal White Cement See Ad on page 33 Information Request # 9270 Finest Finish Blends™ interior pool finishes manufactured by Universal White Cement™ are designed to provide the final touch to your swimming pool project, bringing your vision to life. 800-860-6928 finestfinishpools.com Information Request # 9268 Oceanside Glasstile Company 760-929-4084 glasstile.com Oceanside Glasstile is a world leader in design and production of hand crafted glass tile. They provide unique and innovative glass products to the tile, architectural, design and landscape industries including consumer markets.